For Spring 2012 Green Noise is offering 10-pound bags of worm compost in 12 x 20″ burlap bags tied with jute twine for $12.00/bag. Green Noise LLC is now accepting reservations for Spring 2013. 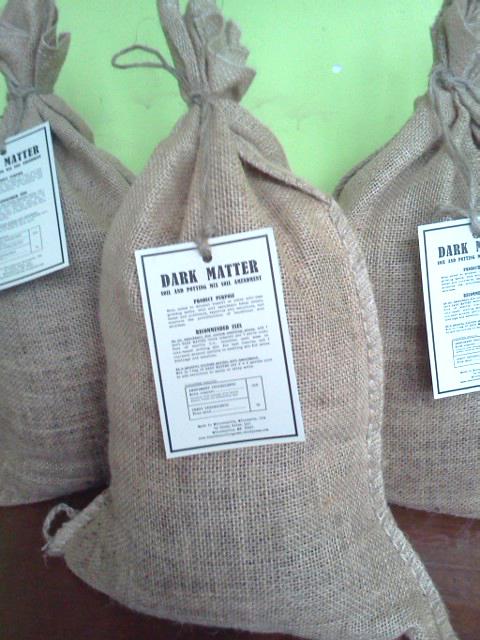 If you know the amount of Dark Matter desired (in # of 10-pound bags), send us an email and we will add you to the list. Bags are delivered weekly, usually on Friday or Saturday during business hours, but mid-week orders can also be arranged upon request. Orders for bags of worm compost made by e-mail by Thursday by 7pm will be delivered during business hours on Friday or Saturday morning by 12pm noon. We ask that orders include a minimum of six (6) bags, and that the bags of moist worm compost are stored in a location within or outside a store where they will not be in the direct sun or exposed to rain. Sample bags are available upon request.